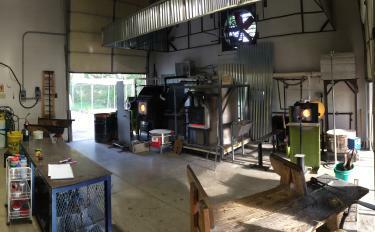 The furnace burned bright red, and I could feel the heat rolling in waves toward me as glass and metal artist Lisa Pelo showed me around her Hot Blown Glass, Ltd Studio. Pelo’s home is tucked away in the rolling farm hills of Clayton, Indiana, not too far from Plainfield and Avon. Her studio, located in her backyard, is complete with a furnace for heating the glass and various other tools to shape it, such as drills, grinders and polishers. She also has a showcase of inventory ready to sell. I spent some time browsing the shelves and was in awe of the colors, textures, and details. The variety of items was considerable: sculptures, paperweights, flowers, vases and platters. My very favorite were the beer glasses. In addition to her own artwork, Pelo creates installations, wholesale items, custom requests and individual commission pieces. To round out her income, she also does bus tours, team building groups and business parties. Some companies have brought their employees out to her studio and made their own creations, such as paperweights, for an employee appreciation night or a company Christmas party. Pelo worked at the Indianapolis Art Center for nearly 14 years, teaching glass art and heading up the department. Yet the 50-minute commute and the traffic pushed her to build her own studio where she has the best of both worlds: creating and teaching. “I do classes, private lessons and a smaller version of the hands-on session where someone can come with up to three friends and make a simple paperweight with me,” Pelo said. 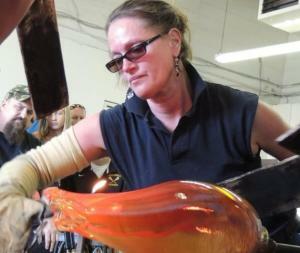 During hands-on sessions, patrons learn to melt glass, color it and shape it to create a small piece of art, such as a paperweight. Pelo also sometimes takes to the road in her mobile trailer so that she and her coworkers can do hands-on demonstrations for the public at certain venues and events. 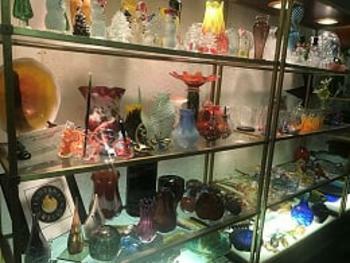 “There’s nowhere here you can go to try it, touch it or experience it,” Pelo said, explaining that the glass market in Indianapolis is minimal compared to where she grew up in Ohio. She loves to encourage first-timers not to be intimidated by the glass and heat but to trust her in the process. Showing others the excitement of working with glass fulfills her. Pelo’s favorite part about her business is creating commission pieces for clients. She cherishes the satisfaction that comes when she makes a piece for a client, and they love it. While Pelo’s studio is not open to the public, private appointments can be scheduled by calling her at (317) 987-6862. You can follow her on Instagram, Facebook or check out her website. Her studio also is on the Rural Routes Main Street Cultural Trail.